Laurie Beyranevand, who teaches administrative law at Vermont Law School, talked to VPR about a change to how administrative law judges are chosen. Last week, President Donald Trump issued an executive order that ends the competitive selection process for administrative law judges (ALJs). Instead, they'll become political appointees. What are administrative law judges? "There's any number of agencies that have ALJs," explained Laurie Beyranevand, who teaches administrative law at Vermont Law School. "So the Social Security Administration has administrative law judges, the Securities and Exchange Commission has administrative law judges. I mean, they sort of vary the gamut." It's important to note that despite the name "administrative law judge," ALJs are actually not part of the judicial branch. "They are technically part of the executive branch," Beyranevand said. "They're called administrative law judges. Agencies are these weird feature that we have in the U.S. legal and political system where they kind of perform the functions — at least a lot of agencies have the capacity to perform the functions — of each branch of government. "So they do a little bit of the execution of the law. They do a little bit of the lawmaking because they write regulations. And then they also interpret their own decisions and they apply their own regulations in certain instances, and that's the function of the administrative law judges. But they act in a quasi-judicial capacity or they act very similar to the way that judges act." Beyranevand said the executive order was based on a recent U.S. Supreme Court decision challenging how administrative law judges are appointed. Previously the selection process was overseen by the Office of Personnel Management, explained Beyranevand. "There was a whole set of criteria that they were applying to the selection of administrative law judges," she said. "They had to go take a written and oral examination. They had to appear before a panel that had a former administrative law judge, members of the American Bar Association, some people from the Office of Personnel Management. Their decisions were being based on a merit system. "And so I think the big concern now is that all of that is being eroded, and essentially someone can be appointed as an administrative law judge based on what the agency decides are the appropriate qualifications. So you could see wide variation from agency to agency depending on what they would think would be the appropriate qualifications for an administrative law judge." Some may wonder though why this new manner of appointment, versus a merit-based system, would be such a big deal, considering the administrative law judges already work for an agency, which we assume is an agency under the auspices of the executive branch. "I think the question here is if people had traditionally gone through this normal civil service process," Beyranevand said, "the qualifications that you were looking at for ALJs previously were to see can somebody act as a judge, or a quasi-judge, and can they make objective decisions? If you look at their track record of work, does it appear that they have the qualifications for this particular position? "If the agency takes control of that, clearly you move from a system where you're looking at the more objective qualifications, moving from that, to looking to see does this person not only have those qualifications but are they also in line with the objectives of the agency at this point." One thing the U.S. Supreme Court did not address in their ruling was the removal process for these judges — which means they can only be removed, as it has been, for cause. "And giving an administrative law judge the freedom to know that they can only be removed for cause means that an administrative law judge might not necessarily have to feel, even if they got appointed through some sort of political agenda, it doesn't mean they have to follow that political agenda for fear that they might be losing their job if they don't," Beyranevand said. Beyranevand said that she knows there are Social Security administrative law judges in Vermont, "but I'm sure there may be others at a federal level — we obviously have our own set of state administrative law judges," adding that those state-level individuals are not affected by the executive order. So ultimately, is there some cause for concern regarding this executive order changing the way administrative law judges are chosen? "It sort of will depend on how it all shakes out," Beyranevand said. "I mean on the one hand, you can see the benefit to having an agency decide what the agency thinks the qualifications are," she continued. "I mean, agencies in the United States handle so many different types of technical matters. And so an ALJ at the Securities and Exchange Commission might need a very different set of qualifications than an ALJ at the Social Security Administration. "On the other hand, I think there's always the concern with agencies that if you politicize them too much or if you allow them to be impacted by the political process too much, that they lose their impartiality and they lose a real benefit that we see in administrative agencies which is — the hope is — that they are using their technical experience and expertise and being shielded from Congress to a certain extent so that they're not impacted by politics and that they're making decisions based on their expertise. "If you start to have agency heads deciding who the ALJs are supposed to be I'm sure there's ... that concern of agency capture or that special interests are going to capture that agency and that that will inform the decisions of those administrative law judges." Both of Vermont's two U.S. senators are expressing very strong concerns about President Donald Trump's nominee to the U.S. Supreme Court. 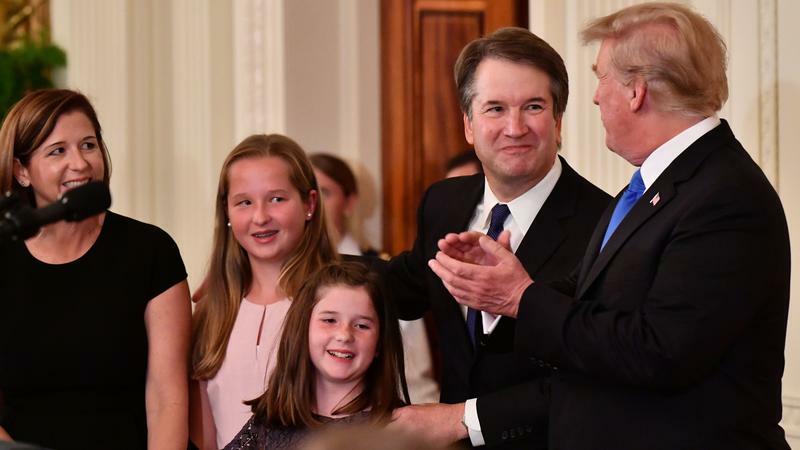 President Trump has chosen Brett Kavanaugh to fill the Supreme Court vacancy left by retiring Justice Anthony Kennedy. If confirmed, Trump's choice would solidify the high court's conservative majority and continue the president's push to shift the federal bench to the right. Trump announced his choice with a prime-time address from the White House East Room.